PGAV set out to be a “mainstream” Architecture firm; but in truth, we were different from the start. Recently, I made an offhand comment to an industry insider, about 2015 being PGAV’s 50th anniversary. I was in the middle of making a completely different point when he stopped me. My memory raced through the people and companies I know. I started to suggest others, thinking perhaps there was another, but I realized – he might be right. Mulling this over led me to consider what things have changed in that time. The objective evolutions are obvious: our growth from four people to more than 120; the fact that my favorite pair of pants has become cluttered with a collection of clashing client logos; and that my golf game is worse, even with all my colleagues’ advice during IAAPA’s November festivities. The most important of these changes is a simple one. It’s our point of view. PGAV set out to be a “mainstream” Architecture firm; but in truth, we were different from the start. Fred Guyton, our founding and most colorful partner, is a differentiator. That fundamental aspect of our nature is baked into our DNA. Our entry into conceiving attractions for large groups of people can be traced back to accepting a job for a “little bird garden.” Another firm had rejected the assignment – it was out of line with how they saw themselves – it was at a time when most Architects generally condescended toward themed construction. But we took it. We welcomed what others resisted. We were always against the grain. Initially, we approached our work from a client-service orientation, learning that time spent digging deep into how our clients thought, felt, and did business was a super-benefit to long-term relationships and our success. This too was grain grinding: we weren’t swooping in to “rescue” our clients with brilliance, vision, and ready-made, intuition-driven solutions, then flying away in our private jet. (We did have a plane back then, and a helicopter. I never rode in them.) No, we listened, we learned, and we then helped craft great paths forward – together, resulting in bonds that lasted longer than Stan Musial’s career with the St. Louis Cardinals. The early connection-style led to early hallmark projects, Busch Gardens Williamsburg and Busch Gardens Tampa. Williamsburg, then referred to as “The Old Country,” is certainly one the most beautiful theme parks in the world (at least that’s what the National Amusement Park Historical Association said for more than two decades). That early opportunity ran heavily on intuition and the distinct talent of one of the industry’s unsung and now most senior creatives, my friend Bill Castle. Like so many design firms, we leveraged the power of one or two individual visionaries. But… we didn’t yet know what we know now. Circumstances then led us to being architects for Universal Studios Orlando. Our team lived and worked among the art directors of that park, and contributed to how a brand was literally born. Being part of this process, and being part of a team creating something that at the time had almost no precedent – and no common terminology – allowed us to accept what was happening more easily; to not resist it or to say to ourselves, “we’re architects, not brand strategists.” We did the work and learned a new kind of park, and a new kind of product, from a new perspective. Clarity began to form around tactics; understanding how crowd management works, how guests WANT to spend a day in a park, and that it might not be what WE think; and that people have tendencies that are to be understood and leveraged so as to improve their enjoyment. 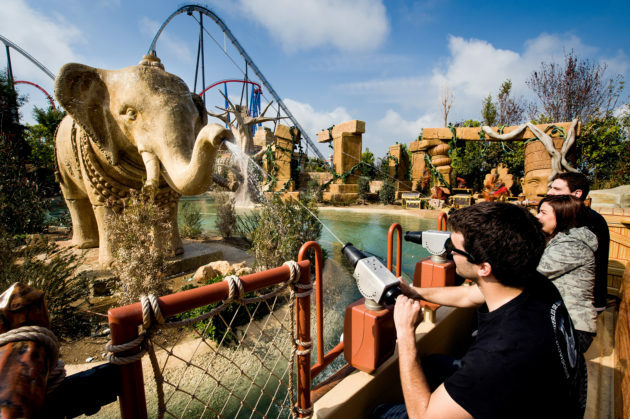 No sooner had we moved on from that project than we were awarded the lead consultancy for Port Aventura. A great site in a beautiful location and the chance to genuinely plan by virtue of these nascent principles was the opportunity of a lifetime. Much of what we still believe lies beneath the plan of that park, and it performs and grows even as I write this. However, there was another lesson, and this time it was humility. Our confidence had peaked as we entered that project. We were certain we could excite the Spanish marketplace with exotic themes and faraway places. Nope. Focus testing corrected our understanding quickly, and we were told by the guest in certain terms that there were themes that absolutely would fail … turn them completely off … non-starters. So, we adapted. Big lesson, there. Our intuition may be strong, but it always needs a check mechanism. Always. SeaWorld has shown us that listening closely to the guest is the most critical key to the solution of any problem in the theme park world. In an industry where “what’s next” is ALWAYS the most important thing, here we are with a client who must invest in, research, innovate, defend, and evolve the habitat and care of living animals amongst themed attractions… a tremendous, and completely unique responsibility. These guests will show you by their actions and reactions (if you get the place and planning right) that what they really want is to get closer to the animals. Closer physically, closer intellectually, closer emotionally. They feel a bond with those animals, and anything we can do as interpreters, planners, creatives, and conservationists, to get them a unique point-of-view, to create proximity, to… dare I say it… let them touch them, is going to allow them to feel connected; to enjoy … to feel … a deeper meaning and a deeper understanding. They’ll have a good time, and they’ll care more about the future of these animals. Observing the success of the SeaWorld parks, studying animals, listening to our clients and their guests, we were inspired to shrink the barrier between us and the “fantastic wild” a bit further. We learned that added value and the depth of an experience can create surprising results. SeaWorld’s hypothesis was that the guests would want to come to touch dolphins, one of the most exciting animals under human care, and the rest of a destination would be kind of a nice “give-away” – foam on the latte, if you will. But what we learned, when we put this hypothesis into action and began carving out winding, beautiful lagoons and breath-taking corals, was that while people come to touch dolphins, the rest of the features at the destination provided some of the highest guest-satisfaction values. All that “extra stuff” which needed a champion through the many value engineering conversations along the way, proved to be meaningful, added value. Really big lesson. That destination was Discovery Cove, honored with a Thea Award by the Themed Entertainment Association, Top Waterpark by Zagat, and the Number One Amusement Park in the World by TripAdvisor. We brought this “institutional knowledge” to the table for Chimelong Ocean Kingdom. Of course, we thought we knew how to plan a park, gauge when and where people need to be and how one arrives at an overall program; where to put the food and the retail. However, oftentimes Chinese destination developers don’t trust things like focus group testing and “intent to-visit” research. They tend to subscribe to the “individual vision” approach, wherein the primary decision-maker gets what he sees as a vision, and our job is to enhance it with the skills we possess. That “East meets West” (but with skepticism) philosophy was a challenge to work through while preserving the integrity of a park that could see 60,000 people in a day. The big lesson there was “explain, explain, explain,” but “listen, listen, listen,” and realize we were the ones in the New World, and we were the ones who must adapt again. In the end, this collaboration resulted in an original, immense, successful destination; the most popular theme park in China, with numerous Guinness world records and honorable superlatives and awards (including a Thea Award). The collaboration worked; and again, I say, “explain.” The key to a successful relationship is strong, two-way communication. Obvious. When there are multiple languages and two completely different cultures, that need becomes paramount, and it’s difficult. The alternative is failure, however, and unhappy guests. So, we invest. Big lesson. When we meet someone new, that we like and want a relationship with, we want to tell them everything about ourselves. We want to impress them with our wit, our charisma, our athleticism, our intelligence, or even our golf game. But too often we forget to listen. That’s the key: to actively listen. It took us 50 years of learning about ourselves in America to understand; to evolve from wanting to be the “Big Ego, Big A” architecture firm into the “Little a, Big Heart” destination design firm that we now love being. There may be fewer personal, individual accolades, but there are a whole lot more happy guests in our destination creations. In a whole new, booming frontier of destination development, we’re re-learning to listen, to empathize, to understand, strategize and design, and to move forward – and just a little bit closer – together.